Crown of Thorns Notre Dame: The priceless relic saved. If it weren’t for the quick thinking of a man named Jean Marc Fournier, then Jesus Christ’s Crown of Thorns could, right now, be nothing more than a pile of ashes. First referred to in the sixth century, the Crown of Thorns was said to have been placed on the head of Jesus Christ during his crucifixion. It was, according to The Bible, a way of mocking a man who believed himself to be ‘King of the Jews’. Roman soldiers took the ultimate symbol of royalty, and turned it into one of pain and degradation. Blood, in Catholic iconography, dripped down Jesus’ forehead, and the crown has since become a ubiquitous Catholic symbol of persecution and sacrifice. The Crown of Thorns which, until Monday, sat inside the Notre Dame Cathedral is a much revered artefact to the 1.2 billion people in the world who identify as Catholic. And on April 16, 2019, we nearly lost it. On Monday evening, a fire, the cause of which is still not known, burst through the Notre Dame cathedral in Paris, destroying the landmark’s spire and much of the roof. 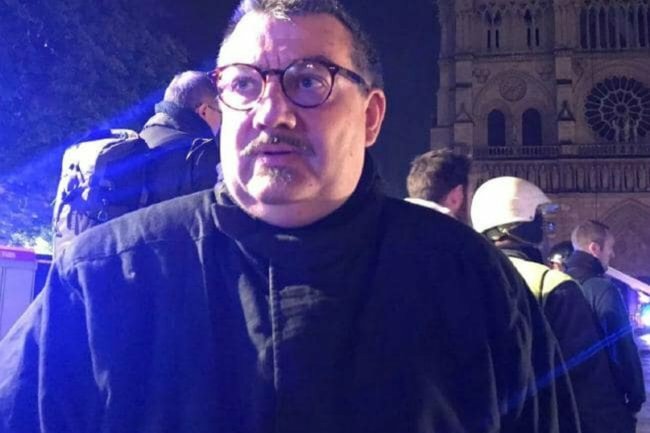 The chaplain of the Paris fire service, a man named Jean Marc Fourier, held the keys and the codes to Notre Dame and entered the burning building to save the “most precious and most venerated relic”. He unlocked the room that housed the Crown of Thorns and the Blessed Sacrament and handed them to police. We need to talk about Australia’s Notre Dame. Post continues below. This wasn’t the first time Fournier demonstrated profound bravery. In November 2015, the chaplain rushed into the Bataclan music venue, and prayed over the dead while comforting the injured. Before dedicating his life to the church, Fournier served in French armed forces where he was deployed to Afghanistan. Of course, Fournier is far from the only hero in this story. He was among many who risked their lives to preserve pieces of history. Firefighters worked through the entire night to contain the inferno, saving far more of the cathedral than was expected. The relics are now being held in the Louvre and Notre Dame is in the midst of what is predicted to be a five year restoration process.